GEORGE GROVES upped his chances of a British super-fight with Carl Froch after a convincing points win over Glen Johnson. Groves is angling for a crack at Froch’s IBF super-middleweight title next year and did his cause no harm with a unanimous decision. Jamaican Johnson, 43, was last stopped 15 years ago by ring legend Bernard Hopkins so Commonwealth champ Groves knew he would have a tough task on his hands. But he met the challenge and took his streak to 16 fights without defeat. Groves, 24, said: “I’m very happy and pleased. I’ve learnt a lot from that fight. “I fully understand now why Bernard is the only fighter to have stopped Glen. I thought he was out on his feet but he wasn’t. “He is a great fighter and exactly what I needed at this stage of my career. “At times he outfoxed and ‘old-manned’ me but it was about getting back to my boxing. I showed my skill. “I know they don’t all crumble easily, especially Glen. Groves, who had heavyweight stablemate David Haye in his corner, started the fight by probing Johnson with a number of stiff left jabs. And when there was no reply, he upped his work-rate and let fly with a flurry of right hooks and uppercuts that Johnson absorbed. The second and third rounds at the ExCeL were more even with Groves’ defence being tested and shown to be sound. Adam Booth, Groves’ trainer, used the break before the fifth to encourage his charge to unleash more attacking rights and Groves did just that, only for Johnson to hold firm. Groves then rocked Johnson in the sixth round with two right hooks — before his opponent had the best of the seventh thanks to a sweet head shot. But the champion, who was a four-year-old when Johnson made his pro debut, got out of danger. Groves always looked like he lacked the power to stop Johnson, who had gone the distance in all but one of his previous 70 bouts. In the final round Groves gave it his all while Johnson appeared to slip — but was given an eight count. Every judge had Groves a clear winner, which will no doubt fire a warning to Froch. 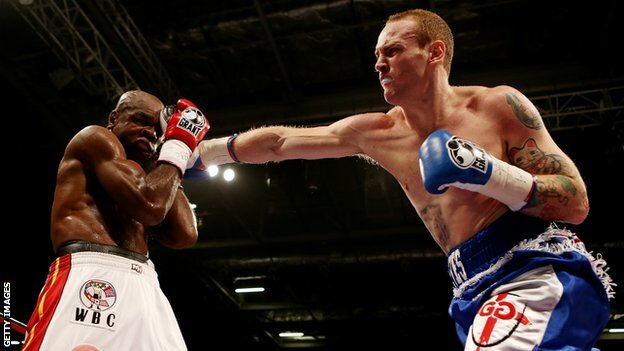 George Groves beat veteran Glen Johnson with ease in their super-middleweight bout at London's ExCeL Arena on Saturday. The 24-year-old Londoner scored a unanimous points victory over the 43-year-old to be unbeaten in 16 fights. Despite landing a number of strong shots throughout the 12 rounds, he was unable to end the fight early. Johnson has lost 18 fights but has only failed to go the distance once, against Bernard Hopkins in 1997. Former IBF light-heavyweight champion Johnson has defeated the likes of Antonio Tarver and Roy Jones Jr along the way and only lost to Carl Froch on points when they met last year. Groves said: "I'm very happy with it and I've learnt a lot from that fight. "On more than one occasion I thought he was out on his feet and he wasn't. I fully understand why he's only been stopped once in 71 fights now." An energetic Groves started quickly, taking the first round in emphatic style and it was the second round before Johnson landed any meaningful shots of his own. That set the tone for the rest of the fight; the Londoner's shots frequently finding their mark - although danger was always lurking from the more experienced fighter's strong right. Johnson found himself on the ropes at the end of the sixth, facing a barrage of blows from the Englishman that looked to have him in trouble, but the bell rang as Groves looked to finish him off. Groves continued to batter Johnson for much of the seventh, keeping his opponent pinned to the ropes. But the Jamaican was somehow able to respond in the closing seconds when it had looked like he was finished. Johnson then found a way through Groves's guard early in the eighth while landing with some strong shots in the ninth but the younger fighter was able to ride the punches and kept probing for a way through. Groves desperately sought to end the fight early and do what Carl Froch could not. And though he knocked Johnson down in the final round, he had to wait for the judges' scores to confirm victory. Groves headlined the bill after Scottish fighter Ricky Burns's WBO world lightweight title defence against Jose Ocampo was cancelled. On the undercard Billy Joe Saunders , 23, won the British middleweight belt and successfully defended his Commonwealth title and against Nick Blackwell with a unanimous points decision. Saunders is now undefeated in 16 fights after turning pro following his appearance at the 2008 Olympic Games in Beijing. Liam Smith beat Steve O'Meara to win the vacant Commonwealth light-middleweight title.